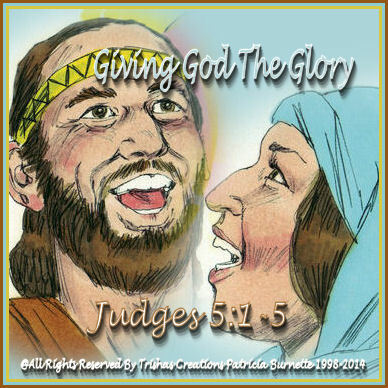 Welcome to "Giving God The Glory"
Deborah and Barak gave God the glory for all of their victory over the King of Canaan. Do you give God the Glory for everything in your life! Do you give Him the Glory for the good and the bad things which happen? We are supposed to, no matter what we go through in our lives, God gets the glory for all things! Did, you know God uses people who will give Him the Glory, for their accomplishments? In 1 Corinthians 1:29, God will not allow a human being to boast in His presence. He will not allow us to steal His Glory, which is why He chooses to use and promote those who know they are nothing without Him. Those who always gives Him the Glory and ALL the CREDIT for all their accomplishments and all the things which they have done in their lives. Remember, you wouldn't have what you have, be what you have become, you wouldn't be alive if it, wasn't for God. You wouldn't have your job, your house, your cars, etc if God didn't have something to do with you obtaining those things. So, everytime you accomplish something in your life, DO NOT STEAL the Glory, where the Glory goes, it's ALL GOD'S GLORY not your own! God is the one whom made it happen, and Only God! Give God ALL THE GLORY FOR ALL THINGS!! !